In Project 2013, to represent most people involved in the project, you create work resources and charge them to the project at an hourly rate. Some resources also charge an additional flat fee for each use. This flat fee is a cost per use, added every time you assign the resource to a task, no matter how many hours are involved in completing the task. The first cost you enter is a resource’s hourly rate and an overtime rate (if the resource has one). 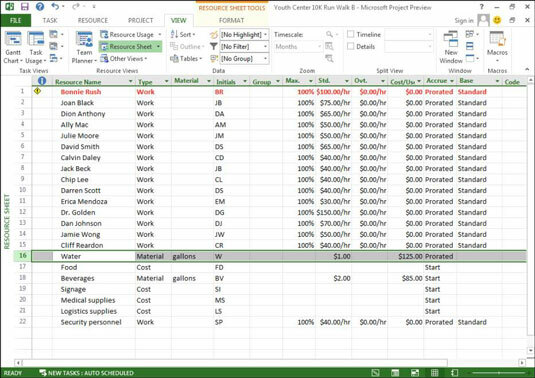 After a resource has an hourly rate, you can enter the estimate of how many hours that person will work on each task he’s assigned to, Project 2013 totals his estimated costs in your plan and adds any cost per use. When you track actual effort expended on tasks, a calculation of actual effort multiplied by the hourly rate plus any cost-per-use returns actual costs. By comparing estimated costs and actual costs, you form an ongoing picture of whether the project is within budget. Click the Std Rate column for the resource to which you want to assign a cost. If you’re entering a rate for a unit other than hours, type a slash (/) and then the unit (for example, year or month). Press Tab to go to the Ovt column. Press tab to move to the Cost/Use column. This amount is the flat-fee amount that will be added every time you assign the resource to a task. You can also make cost-rate entries in the Resource Information dialog box. 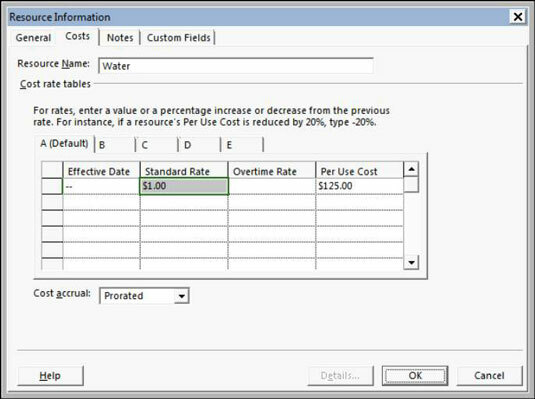 The Costs tab of this dialog box offers columns labeled Standard Rate, Overtime Rate, and Per Use Cost. In many projects, you don’t track the cost per resource for internal resources because people’s salaried rates are generally considered confidential. Sometimes, a standard midrange or loaded-resource rate is used to track employee rates by job grade.